Sometimes when the weather starts to cool, a creamy, rich, comforting soup is exactly what we need. 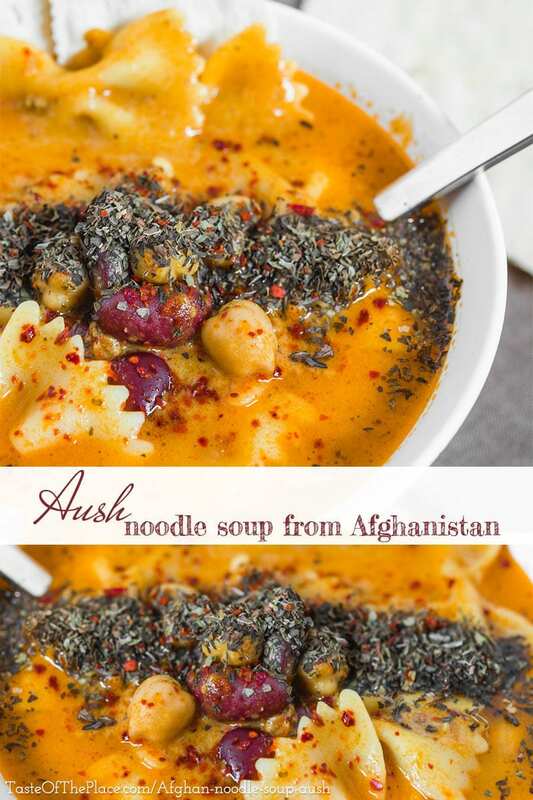 Aush, or noodle soup, from Afghanistan, fits the bill perfectly! Loaded with spices, filled with meat and pasta, and enriched with cream, this divine soup will brighten even the coolest of autumn days or dreariest of winter nights. September has arrived, and soon the autumn nights will begin to cool. I love all times of year, but the changing of seasons always makes me happy. 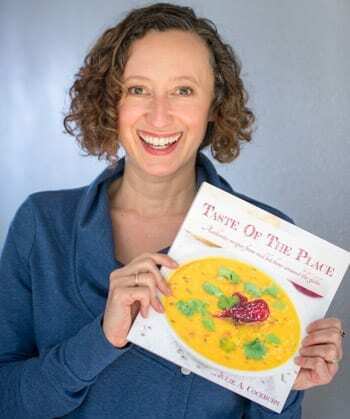 And while the weather may still be on the warm side at my house, my thoughts are beginning to turn toward cozy sweaters, cute boots, and, of course, warm soups and stews. This particular soup – it’s called aush, and comes from Afghanistan – is perfect for a cold weather evening. It is a rich and satisfying comfort food, loaded with hearty pasta, savory beef, plenty of delicious spices, and enriched with cream. Yumm! 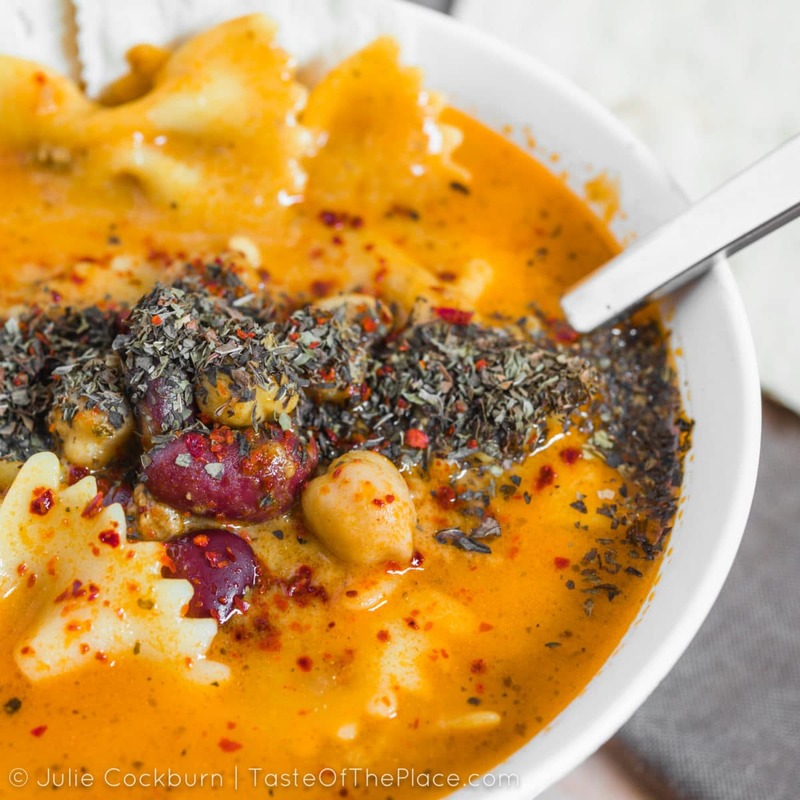 The quality of your spices will make a huge difference on the flavor of your finished soup. Try to use the freshest spices you can, and in the case of the dried coriander and black pepper, grind them fresh just before use. The flavor and aroma of freshly ground spices is worlds away from the bland pre-ground stuff available in most grocery stores. If you are looking for an online source to buy fresh spices, my absolute favorite spice source is Savory Spice. Click HERE to visit their online shop. If you want to make your aush ahead of time, follow the directions as instructed, but skip adding the pasta. Then when it comes time to heat the soup for serving, add the pasta, along with extra water if needed, and cook until the pasta is tender. Heat a generous lug of olive oil in a big soup pot or dutch oven over medium-high heat. Once hot, and the onions, and sauté until they begin to brown. Add the garlic, and continue cooking for about 30 seconds. Next, add the ground meat, and cook until almost completely done. Stir in the turmeric, coriander, and tomato paste. Add just enough water to make it look like a soup. At this point, it will be bland, so sprinkle in enough chicken bouillon to make it taste a little overly salty, along with black pepper and/or crushed red pepper to taste. Bring the soup up to a boil, add the dried pasta, and give it a stir so that the pasta can absorb all that spicy, salty goodness. Stir in the garbanzo beans and kidney beans, along with enough water to bring it back to a soupy consistency. Bring everything back up to a boil, and cook until the pasta is tender. Meanwhile, combine the yogurt and sour cream. Mix a small amount of the hot soup into the dairy to temper it and prevent curdling, then stir the dairy into the soup. Serve the delicious, steaming bowls of hot Aush with a generous sprinkling of dried mint on the top. Dutch ovens are fantastic for not only making big batches of soup, but for all kinds of cooking (I usually use mine several times a week). They can be quite expensive, though. This 7 quart model from Cuisinart, HERE on Amazon, is a great product, without the sky-high prices of the top of the line brands. The freshest spices make the best dishes! My favorite spice source is Savory Spice.